Today, February 4th and tomorrow, February 5th, Comic Relief are celebrating 25 years of fundraising. To mark this occasion they would like to highlight the incredible work that has been achieved in Africa and here in the UK and have taken 3 fabulous bloggers to Ghana to help. Penny from Alexander Residence, Tanya from Mummy Barrow and Annie from Mammasaurus blog will be spending 2 days in Ghana looking at 4 different projects and the progress that has been made there. 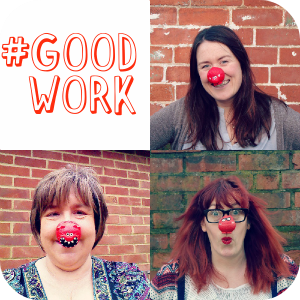 They will be live blogging and tweeting and helping to spread the word with the hashtag #goodwork. If you are on Twitter please do support them, particularly on Tuesday 5th, the 25th Anniversary of Comic Relief. So let’s pay tribute to Comic Relief, the bloggers and everyone who has donated money to Comic Relief over the last 25 years. Go #TeamHonk we are supporting you and cheering you on!